40 days and 40 nights, well not quite but over 9 inches of rain for us in June and another couple in the first days of July. 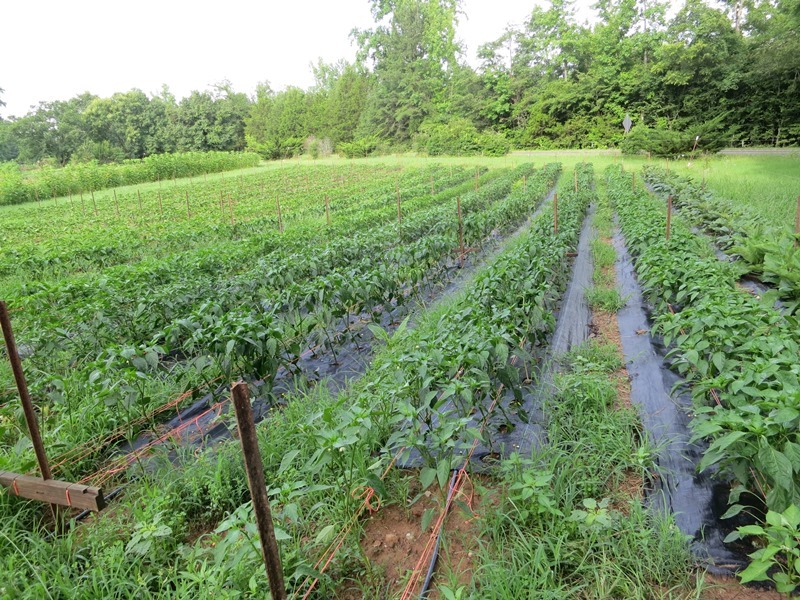 I know lots of folks have had more and certainly the historic rain (5 inches) and flash flood in Chapel Hill and Carrboro on Sunday are much worse than anything we have seen here at the farm this month, we understand the difficulty of post flood clean up. We did have 15 plus inches in a month back in the late 90’s, seemed like it only rained on us, every day. Our only real flash flood was after a dumping of more than 10 inches in just a few hours on a June day, the creek jumped its banks and ran down the side of the bottom field in white caps, carrying top soil and crops with it. Seemed like it rained more back then, at least until this year. The real danger with this kind of weather is not the amount of water but the constant wetness. Most crops just aren’t happy with water logged soils and the diseases are happy in the petri dish like environment of hot and humid. Sunlight is a great sanitizer. So far most of our crops look good but we do badly need to get in and do more trellising in the peppers as they are getting really top heavy but working in wet plants is a sure recipe for spreading disease up and down the row so for now we wait, maybe Friday. So what do farmers do when it is too wet to get into the fields? Start more plants! It is the time of year that we are all beginning to seed, in the greenhouse, all the fall and early winter crops. Celery, Brussels sprouts and leeks are already up and looking good. Yesterday was time for Kale, lettuce, fennel, cauliflower, dianthus, Rudbeckia and more. If you can’t farm outside, go inside and play with plants instead. Tall, tall peppers and we really need to mow those paths too! 4th of July week, today’s market should be a busy one and for those not going away for the long weekend, Saturday is supposed to be sunny! The lack of sun is the limiting factor in the flower department but this is what we should have. It is Lilypalooza, lots of long lasting fragrant pink Oriental Lilies and yellow and pink Asiatics too. The first of the queen of cut flowers, Lisianthus. Nikko Blue Hydrangeas if the rain doesn’t beat them up. Brilliant Zinnias. Plenty of Sunflowers. Beautiful Bouquets of course. Tomatoes more each picking. Plenty of reds with both the sweeter Ultra Sweet and more balanced Big Beefs. A moderate amount of Cherokee purples. A small amount of most of the other colors- yellow with Orange Blossom and the higher acid Azoychka, German Johnson pinks, bi-color Striped Germans, a mix of sauce tomatoes too. Fair amount of Sungolds, Blushes and SunMix cherries. Cucumbers. Sweet Red Onions. Basil for the tomatoes!